The K-T boundary in New Zealand has been known in marine rocks since the publication of Alvarez et al. (1980), and about 20 localities are now known (Hollis 2003). 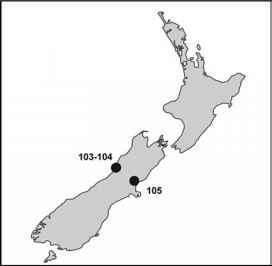 The Woodside Creek locality on the South Island of New Zealand was one of the three localities in the world where anomalous concentrations of iridium were first detected at the paleontologically defined K-T boundary - the level of extinction of marine foraminifera. The boundary in nonmarine rocks in New Zealand took a great deal longer to locate, and was not definitively established until more than 20 years later. 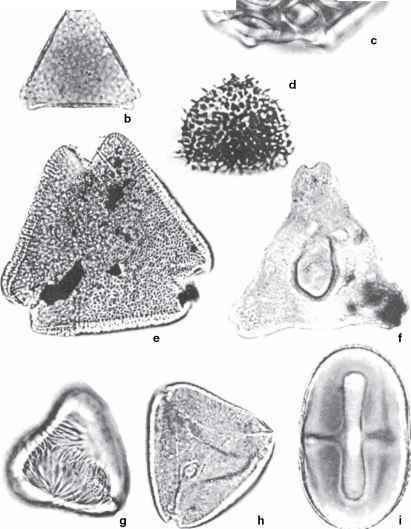 An early paper by Raine (1984) presented a palynostratigraphic zonation of nonmarine Cretaceous and Paleogene rocks in New Zealand. The K-T boundary corresponded to the Hamurian-Teurian stage boundary, the New Zealand equivalent of the Maastrichtian-Paleocene boundary of North America and Europe. No extraordinary changes in the palynoflora were evident across this boundary, however. The ranges of two species of angiosperm pollen, Tricolpites lilliei and Tricolpites secarius, define a palynostratigraphic zone boundary at this stratigraphic position. Using those criteria, the K-T boundary was located in a general way in the Rewanui Member-Goldlight Member sequence exposed along the railway line between the Moody Creek coal mine and the town of Greymouth, on the west coast of South Island. The boundary was definitively located by Vajda etal. (2001), less by an extinction level among angiosperm pollen than by the presence of a fern-spore spike.